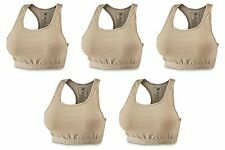 ~~WIRE FREE SPORTS RACERBACK BRA~~. NEW BALANCE. The amazing support of this sports bra will shock you! Tall center front to contain and support. ~~REVERSIBLE SPORTS BRA~~. NEW BALANCE. Gray & Pink. Very Good Condition. New Balance Racer Back Padded Gray Sports Bra - M. Condition is Pre-owned. Shipped with USPS First Class Package. Style: Sports Bra. Military Fire Resistant. New Balance. Sports Bras. Style # AFR401. Sports Bra. Style: Sports Bra. Military Fire Resistant. New Balance. Inside super soft lining for comfort and support. Size: Small. New Balance NB Sports Bra. Pullover Racerback style. small internal cleavage pocket. Keyhole cutout. lined bra padding. polyester blend. Size Small. 4 are by Champion and 1 is by New Balance. All have been worn but freshly laundered. Purple Champion (bottom left) - worn once or twice. All black Champion (middle right). New Balance Sports Bra . Gray in color, T back with removable padding. Nylon/Spandex stretch to move freely with you. Color: Blue & neon yellow. Size: XS (32 AB - 32A). Body 1: 44% polyester/44% recycled polyester/12% elastane. Body 2: 82% polyester/18% elastane. Body 3: 82% polyester/18% elastane. 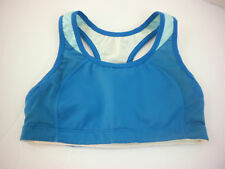 Ladies New Balance Reversible Sports Bra. Two bra's in one! Sports Bra. Style: Sports Bra. Military Fire Resistant. New Balance. Style # AFR401. Style: Sports Bra. Military Fire Resistant. New Balance. Inside super soft lining for comfort and support. Sports Bras. Size: Small.